Bhutan is a land-locked country in Asia located on the Eastern Himalayas and sharing borders with China to the north and India to the south. This Buddhist kingdom is known for its dramatic landscapes, trekking and monasteries. Non-residents traveling to Bhutan will receive a baggage declaration form when they arrive in Bhutan. This declaration form is to ensure that whatever has been brought into the country leaves the country upon departure from Bhutan. Every tourist must keep the this declaration form throughout the entire trip in Bhutan and return this form at the time of departure. In Bhutan, visas are obtained at the airport. Those who drive into Bhutan from neighboring countries such as India and Nepal are encouraged to get their visas from the border check points. Once in Bhutan, visitors will need to obtain a special permit for traveling to certain restricted areas. Travelers to Bhutan are allowed to bring with them up to 1 liter of liquor (Duty-Free) and 1 carton of cigarettes (200 individual cigarettes), but these items incur a 200% duty upon arrival. A pack or two of cigarettes is generally allowed to be brought in free of charge. Procedures for departure are straightforward, but you must be able to produce the declaration form you completed at arrival and may need to show officials all the items listed on it. I have just returned from an amazing holiday organized by our tour company. We visited Bhutan via Bangkok Airways and the whole team booked their air ticket on the same airline. We flew on the economy class and were very happy with the flight. I visited Bhutan for 6 days and got to do a 4-day hike in the Nepalese Himalayas. The experience was beyond incredible. The highlight was the trek up to the Tiger's Nest Temple in Bhutan. What a wonderful day! It was really challenging, but so worth it when you get to the top. Another highlight was the 2-day hike in the Annapurna region. I will definitely be buying another air ticket for Bhutan for my next holiday. My trip to Bhutan started with an air ticket flying Air India. The services provided by this airline were quite good. Bhutan was the most wonderful and friendly country. Peldan, our guide, was the best and really looked after us. He was very knowledgeable about the history of Bhutan and kept us entertained the entire trip. Tiger's Nest was the highlight of Bhutan out of the many amazing places we visited. The tour operator organized the whole tour perfectly, even planning the night of my friend's 70th birthday celebration! A group of 4 friends and I arranged for a tour to Bhutan and booked our air ticket in December of 2016. We were visiting from India and preferred to travel via air, so we booked our air tickets through GoAir. The experience with the airline was wonderful with outstanding service. Our 10 day trip to Bhutan was absolutely unforgettable. We visited many of the famous historical sites like the National Museum of Bhutan, Kichu Lhakang, Manas National Park Bhutan and so many more. Bhutan is a perfect place to visit with friends and family -- a must-see country. I recommend Bhutan for anyone planning to pick up a visa and Air Ticket in future. I cannot wait to visit Butan again. Do I really need visa and Air Ticket to enter Bhutan? All International tourists wishing to fly into Bhutan require a visa and an air ticket, which must be pre-arranged through a licensed Bhutanese Tour Operator or one of their international partners. Visa clearance must be obtained through your tour operator prior to travel. Indian passport (or VIC) holders, Bangladeshi nationals, and persons from the Maldives may obtain a visa on entry. Visitors traveling by road to Bhutan must show their visa, no air ticket is required for land travel. What kind of food is popular in Bhutan? The most distinctive characteristic of Bhutanese cuisine is its spiciness. Chili peppers are such an essential part of nearly every dish and are considered so important that most Bhutanese people would not enjoy a meal without a little heat. Rice forms the main body of most Bhutanese meals. It is accompanied by one or two side dishes consisting of meat or vegetables. Pork, beef and chicken are the meats that are eaten most often in Bhutan. Visitors will be able to experience unique dishes such as momo (South Asian dumplings) and ema datshi (chili peppers and cheese). A wide selection of western and Indian food is also available in Bhutan. What type of clothing should travelers wear in Bhutan? Every new visitor who has booked an air ticket to Bhutan will want to know what clothes to pack. Generally, cotton clothing is recommended for summer days, light wool clothing for evenings and heavier wool clothing for winter. Keep in mind that even in the summer evenings can be cool. Days can be quite warm, especially in the lowlands of Punakha and Phuentsholing. It is best to use the layering system, starting with thermal underwear and adding a shirt, jacket or parka as necessary. Good walking shoes, sunglasses, and sunscreen are items you should also bring with you. Shorts are fine for hiking and walking around town. It is recommended to use longer pants and skirts in buildings or monasteries location. It will be much easier to do your shopping before booking your air ticket to Bhutan. How much does the visa cost for Bhutan? International tourist visas come at a cost of $40 USD, which can be paid in advance through your tour operator or travel agent. For Indian passport (or VIC) holders, Bangladeshi nationals and persons from the Maldives, there is no cost. Prices of air tickets for flights to Bhutan vary depending on the airlines of your choice. Airports handling direct flights to Paro Airport ・ Bangkok Airways(Thailand) ・ Delhi (India) ・ Mumbai (India) ・ Kolkata ( India) ・ Bagdogra ( India) ・ Gaya ( India) ・ Guwahati ( India) ・ Kathmandu (Nepal) ・ Dhaka (Bangladesh) ・ Changi (Singapore) etc. Paro Airport is the only international airport in Bhutan. It is 6km away from Paro in a deep valley on the bank of the river, Paro Chhu. With surrounding peaks as high as 5,500m, it is considered one of the world's most challenging airports to land in. Bhutan may be small but many Asian airports offer access and flights to the country. 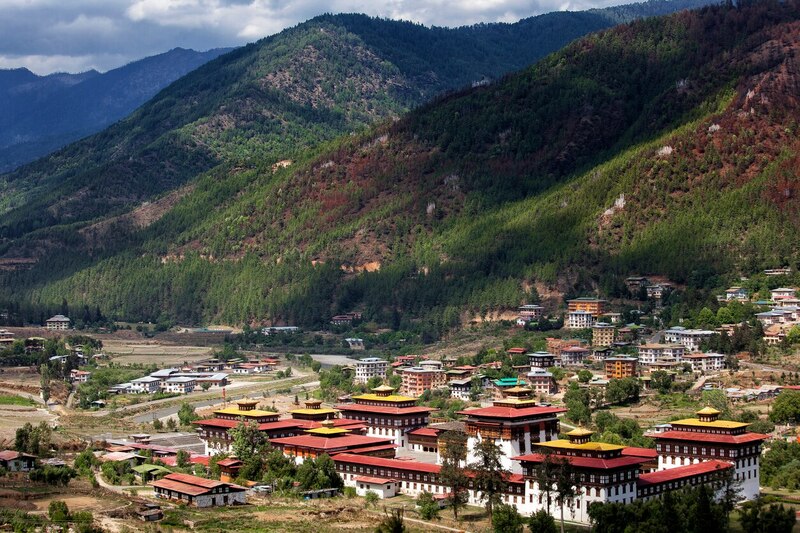 If air tickets to Bhutan are available from where you live, this is a destination not to be missed! Flights to Bhutan are available from Thailand, India, Nepal, Bangladesh, Singapore, China, etc.